After a worldwide promotional e-mail seemingly revealed a forthcoming Intel Core i5-equipped MacBook Pro, the chip maker has modified the contest and apologized. A newly revised e-mail sent to members of the Intel Retail Edge Program has changed the contest to offer a new HP Envy laptop, equipped with the new Core i5 processor. 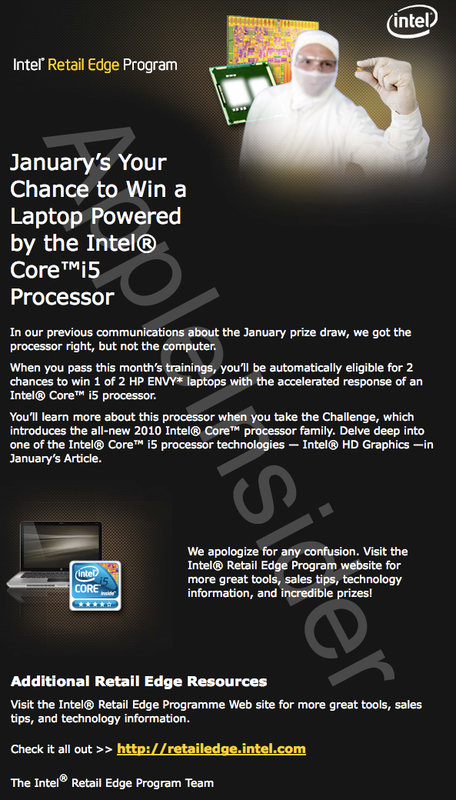 "In our previous communications about the January prize draw, we got the processor right, but not the computer," the new e-mail states. "When you pass this month's trainings, you'll be automatically eligible for 2 chances to win 1 of 2 HP ENVY laptops with the accelerated response of an Intel Core i5 processor." "We apologize for any confusion," it continues. "Visit the Intel Retail Edge Program website for more great tools, sales tips, technology information, and incredible prizes!" On Wednesday, the chip maker caused a stir when its Retail Edge Program offered two chances to win a MacBook Pro equipped with an Intel Core i5 processor. Currently, the MacBook Pro line employes the Core 2 Duo processors. The Retail Edge Program allows retail employees who sell Intel products to access technical knowledge and sales tips, which gives them the opportunity to earn "chips" which can be exchanged for products. The program also offers occasional contests and giveaways. Intel's mobile Core i5 processor is considered to be a likely candidate for a coming MacBook Pro refresh. The new processors improve on the previous line of Core 2 Duo chips, which can be found in the new MacBook, MacBook Pro and iMac. Apple uses the mobile variants of Intel's desktop chips for those systems. At CES last week, Intel formally introduced its new line of processors, which include the Core i3, i5 and i7. The first 32 nanometer processors have the major northbridge memory controller components built in. The new Core i5 processors were benchmarked earlier this month and found to have better performance than their Core 2 Duo predecessors, without a negative impact on battery life. Based on the Arrandale architecture, the new chips use a 32nm Westmere Core and a 45nm chipset, allowing improved speed, better graphics, lower power consumption, and smaller motherboards.